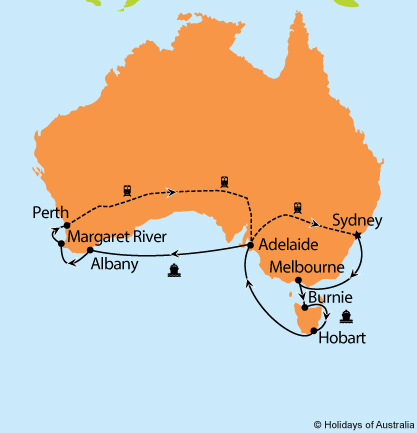 Cruise the stunning Southern coast of Australia before exploring the highlights of Western Australia. Complete your Aussie adventure with a journey aboard the iconic Indian Pacific. Discover the picturesque and world famous Margaret River region. Wander the shores of Monkey Mia Beach and watch for the famous dolphins that come in regularly to interact with people. Explore stunning scenery, red-rock gorges and spectacular coastal cliffs at Kalbarri National Park. Witness the mystical Pinnacles Desert in Western Australia. Say hello to the Rottnest Island Quokkas, world renowned as the happiest animal on Earth and an icon of the island. Indulge in the all-inclusive service on board the Indian Pacific. 4 night stay in Perth at Pan Pacific Perth including breakfast daily. Full day Grand Rottnest Island tour including lunch. Transfer from your accommodation to East Perth Rail Terminal. Transfer from Sydney Central Station to Sydney Airport.